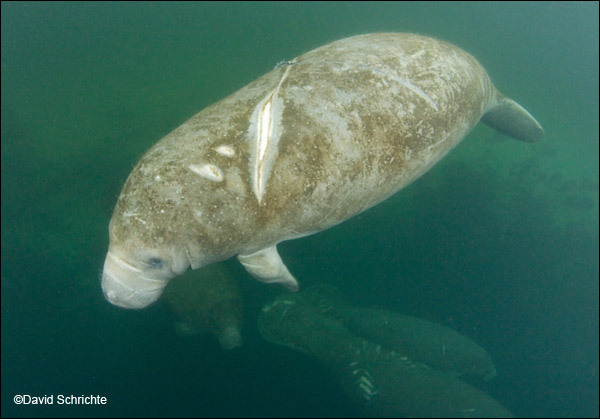 Over the years, researchers have attempted to identify and quantify West Indian manatee distribution, population size and causes of mortality in order to understand manatees and the threats to their survival. They have isolated several causes of manatee deaths, most of which are directly related to human contact or encroachment. If these sources of mortality are not controlled, manatees may become extinct. A living manatee bears scars from a watercraft collision. Flood Gate or Canal lock: Manatee mortalities caused when the animal is crushed and/or drowned in these structures. Perinatal: A dependent calf less than 150 cm (about 5 feet) that died around the time of birth and was not determined to have died from human-related causes. Other Natural: Mortalities caused by natural circumstances such as cold stress, red tide, gastrointestinal disease, pneumonia, and other diseases. Undetermined: The manatee is too badly decomposed to determine cause of death, the necropsy finding is inclusive, or the manatee carcass was reported and verified, but not recovered. Download 2018 Manatee Mortality and Rescue Statistics, a sheet with statistics from 2018 and information on how to report an injured manatee (pdf).